Commuters, motorists and other users of Premium Motor Spirit (petrol) faced tougher conditions on Tuesday as the latest round of fuel scarcity in the country got worse , with its attendant negative impacts on transportation and businesses . Some frustrated Nigerians narrated to our correspondents their ordeals while trying to get petrol at the few filling stations that were selling the product in Lagos, Ogun, Abuja and Owerri. Our correspondent who visited the Nigerian National Petroleum Corporation depot in Ejigbo, Lagos, learnt that only 28 tankers loaded PMS on Tuesday, down from between 40 and 50 tankers daily before the scarcity began, while many private depots in Apapa were still without the product. Commuters were seen at many bus – stops struggling to get commercial vehicles to different destinations, even as transport operators increased the fares by as much as 100 per cent on most routes. The long queues of desperate motorists at some filling stations in parts of Lagos spilled onto the roads and caused gridlock, making commuters to suffer more pain. A commercial vehicle driver, Mr . Obinna Jonathan , said , “We don’t know where this country is heading to because we experience fuel scarcity every year, especially in December . Since morning , I have been looking for fuel . Even yesterday (Monday ), I know how I struggled to get N3 ,000 worth of fuel , which I used to convey passengers . Another transporter , Mr . Muftau Badmus, who was seen pouring petrol from a jerry can into his tricycle at Cele Bus – Stop , along the Apapa – Oshodi Expressway , said he got to a filling station at around 5 :30 am and did not get fuel until around 2 pm. “ I have told myself that after using up the fuel I bought today, I won’t come out tomorrow . The government should help us to solve this scarcity because the poor people are the ones suffering now. All the government people are not suffering but we that voted for them are the ones feeling the pain,” he lamented . With sweat running down her face as she sat in her car waiting at a filling station along Okota Road to get petrol, Mrs . Kate Chukwu did not hide her frustration over the situation in the country. She said , “ I have been in the queue for over one and half hours just to get fuel . It is really outrageous and frustrating that we even have to pay an extra N200 to get the fuel . It is really bad because now I am supposed to be at home cooking , but I am here waiting to get fuel . A motorist , Mr. Sunday Isong , said the struggle to get petrol had disrupted his plan to travel to Cross River . He stated , “ Today, I am very confused and tired ; I have been running up and down the whole day to get fuel . My car stopped at a particular point because of fuel . I started moving up and down with a jerry can, looking for fuel . I was eventually able to buy five litres of fuel for N1 ,200, which I put in the car to enable me to run around to see where I can get more fuel . Mr . Yemi Adewole , who runs a laundry business, alleged that many of the filling stations had the product but were reducing the rate at which they sold it so as to profiteer from the situation. Meanwhile , the Department of Petroleum Resources said in a statement that it had come to its notice that some depot owners were selling PMS to unlicensed bulk buyers and some retailers at prices above the approved ex- depot prices, adding that some retail outlets were hoarding the product or selling at above the industry- set cap price. He added that the agency had been punishing the errant operators and warned that penalties would be imposed on any operator engaging in illicit acts . “ We are also assuring the public that the government is doing everything to ensure the restoration of normalcy to the sector,” he added. In Owerri , the Imo State capital , a litre of petrol sold for N200 on Tuesday instead of the approved price of N145. This is even as the prices of goods and services , especially transportation fares, have increased by between 80 per cent and 100 per cent . Most residents of the city called on the Federal Government, through the DPR and the state’s Ministry of Petroleum Resources, to caution the independent petroleum marketers in the state. A commercial driver in Owerri , who gave his name as Johnson Emmason , flayed the owners of filling stations in the state for what he called arbitrary increase in the pump price. Meanwhile , the NNPC said on Tuesday that it had started releasing 470 trucks of PMS to Abuja and Lagos despite the persistent queues for the product by motorists at the few filling stations that dispensed it . 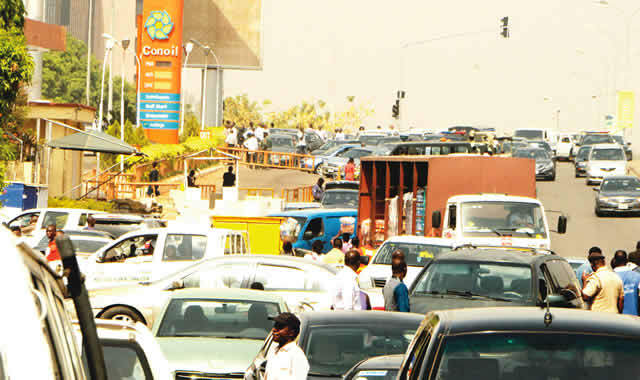 In Abuja and neighbouring states of Kaduna and Nasarawa , the queues for petrol persisted on Tuesday , as hundreds of motorists struggled to get the product.